Dog Incontinence, our dog pants can help! – Mozzie Pants, Pants for dogs and dog suspenders! Dog incontinence is a challenge and common, especially in senior dogs. When my senior boxers started to have incontinence challenges due to taking steroids, I created the Mozzie Original dog pants. It was very upsetting for my boys when they started to drip urine and let’s face it, it was no picnic for me to have urine on my carpet, furniture and bedding. The Original pants have an absorbent pad that absorbs the fluid and maintain home harmony for us all! Our customers find the same home harmony and value in the Original pants. This is Mochi, she is a senior who has Cushings Disease. Mochi was so upset that she was having accidents that she stopped going to bed and snuggling with her Mom, it was so very sad for the both of them. They tried diapers but they wouldn’t stay on Mochi wasn’t comfortable in them. 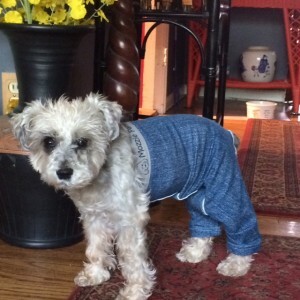 When Mochi got her Mozzie Original pants their worlds changed. Mochi was so happy, she started to sleep in the bed again and became her snuggly self. It is important to understand the cause of your pups incontinence. Here is some information on possible causes from Petmd. Home harmony is our mission! Have fun with your pup! This entry was posted in Mozzie's Thoughts. Bookmark the permalink.